Electronic Arts brought out the star of Need for Speed to showcase the Ford that's in the movie and in the new game. Electronic Arts and DreamWorks Studios debuted the first behind the scenes footage from next Spring’s theatrical release, the action racing film Need for Speed, based on the best-selling videogame franchise from EA. The film’s star, Aaron Paul (Breaking Bad), took center stage during the press conference to unveil the footage, alongside the custom Ford Mustang he drives in the film. The car is part of an exclusive partnership between DreamWorks and Ford Motor Company for the movie. This one-of-a-kind vehicle will crossover from the big screen to the highly anticipated videogame, Need for Speed Rivals, which will be available this holiday, beginning November 19, 2013. Need for Speed Rivals is playable for E3 attendees on the show floor at the EA Booth (South Hall #1601) this week, Tuesday June 11 through Thursday, June 13. Need for Speed marks an exciting return to the great car culture films of the 1960s and ’70s, tapping into what makes the American myth of the open road so appealing. The story chronicles a near-impossible cross-country journey for our heroes—one that begins as a mission for revenge, but proves to be one of redemption. Featuring the same exciting elements that has made Need for Speed one of the best-selling franchises in games – hot cars, epic chases and high-octane action, the film stars Aaron Paul, Imogen Poots (V for Vendetta) and Dominic Cooper (Captain America: The First Avenger). Need for Speed is penned by George Gatins with writing partner and brother John Gatins (Flight) and directed by Scott Waugh (Act of Valor). The film will open in theaters worldwide beginning March 14, 2014. Need for Speed Rivals is the newest entry to EA’s best-selling racing franchise. A collaboration between Ghost Games and Criterion Games, Need for Speed Rivals glorifies the heat of competition in the legendary rivalry of cops and racers. Gamers play as either a cop or racer, where each side of the law has its own set of high stakes challenges, rewards and consequences. This time, the stakes are at their highest as racers put their Speed Points on the line and risk losing them all if busted. Developed on the advanced Frostbite 3 engine, Need for Speed Rivals also introduces the revolutionary AllDrive system that erases the line between single player and multiplayer, automatically connecting gamers to their friend’s racing world. Paths will cross on the open road, creating a world where no two moments will ever be the same. 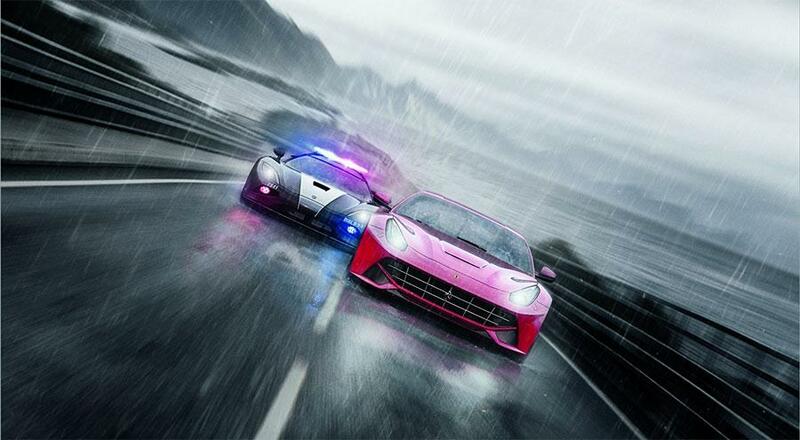 Need for Speed Rivals, will be available on November 19, 2013 for the Xbox 360, PlayStation 3 and PC. The game will launch later for Xbox One and PS4.